Regenerator* Heals for 1/3 max HP upon switching out. ties that are built on groups of these POK�MON. 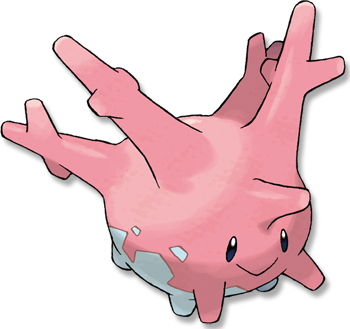 Ruby/Sapphire Clusters of CORSOLA congregate in warm seas where they serve as ideal hiding places for smaller POK�MON. When the water temperature falls, this POK�MON migrates to the southern seas. Emerald CORSOLA live in warm southern seas. If the sea becomes polluted, the beautiful coral stalks become discolored and crumble away in tatters. FireRed In a south sea nation, the people live in communities that are built on groups of these POK�MON. Leaf Green It continuously sheds and grows. The tip of its head is prized as a treasure for its beauty. Diamond/Pearl Many live in the clean seas of the south. They apparently can�t live in polluted waters. Platinum Many live in the clean seas of the south. They apparently can�t live in polluted waters. Heart Gold It continuously sheds and grows. The tip of its head is prized as a treasure because of its beauty. Soul Silver In a south-sea nation, the people live in communities that are built on groups of these Pok�mon. White Many live in the clean seas of the south. They apparently can't live in polluted waters.